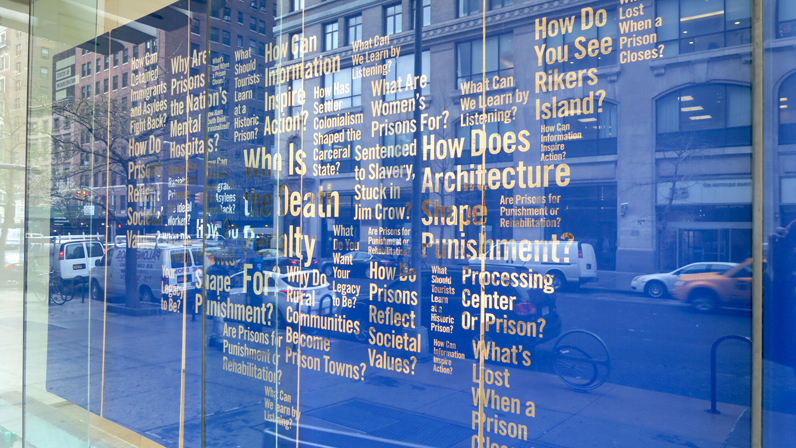 States of Incarceration, an exhibition exploring the history and future of mass incarceration, is on view through April 24 at Sheila Johnson Design Center's Arnold and Sheila Aronson Galleries. For Khalil Cumberbatch, it was never a question of whether he would go to prison, but when. Growing up during the 1980s in South Jamaica, Queens — a neighborhood that was decimated by the crack epidemic — Cumberbatch encountered “systems of oppression” everywhere he turned. Schools lacked adequate funding, police employed harsh tactics, and gang warfare turned pick-up basketball into a life-threatening activity. In this environment, “where everything you do can easily be criminalized,” conversations about imprisonment were as common as those about girls and sports, Cumberbatch recalled. And in 2003, at the age of 20, he was. Cumberbatch’s seven-year sentence was an awakening — not only to the need to turn his life around but also to the injustices of the American prison system. After serving his time, Cumberbatch earned his bachelor’s degree and became a manager of training and communications at JustLeadershipUSA, a national organization that advocates for legislative reforms to reduce incarceration. He also landed a job as an adjunct professor at the Columbia School of Social Work. Cumberbatch doesn’t condone the behavior that led to his conviction. But it’s no surprise, he said, that when faced with so many hurdles to success and so few mechanisms of support, that so many young people like him end up behind bars. Cumberbatch was one of the many individuals who shared stories of incarceration at the two-day national summit of States of Incarceration, a New School-led coalition of 500 individuals from 20 cities across the United States that is building a participatory public memory project on the history and future of mass incarceration. The public dialogues are part of a broader effort — including a national traveling exhibition, Web platform, public dialogues, a participatory mobile campaign, and a podcast — to undertake a national public reckoning with one of the most pressing issues of our time. For the national summit, 500-plus participants of States of Incarceration — students, formerly incarcerated individuals, and leading national scholars and advocates — gathered to explore the deep historical roots of, and share personal stories connected to, an issue that has had a profound impact on American society. Mass incarceration in the United States can be traced to a series of tragic events, “from slavery and settler colonialism to Indian boarding schools and immigrant detention centers,” said Liz Sevcenko, director of The New School’s Humanities Action Lab, the initiative behind States of Incarceration. Today the legacies of those injustices take many forms: systemic racism, harsh law enforcement tactics, steep prison sentences, and economic interests that encourage the expansion of the prison-industrial complex, Sevcenko said. Cherished as the land of the free, the United States has earned the dubious distinction of being the world’s leading jailer: The country makes up five percent of the world’s population but holds 25 percent of its inmates. States of Incarceration — a national exhibition created by students and formerly incarcerated individuals — helps to answer those questions. Designed by Brooklyn, N.Y.-based design firm Matter Practice, it features interviews with formerly incarcerated people, corrections officers, and policy advocates; images capturing the evolution of crime and punishment in various contexts; and data demonstrating the explosive growth of incarceration and its impact on American society. The exhibition will be on view at The New School’s Sheila C. Johnson Design Center through April 24 before traveling to the 19 other communities that created it. In each community, the exhibition will focus on an issue of incarceration unique to that community; The New School exhibition, a collaboration between university students and The Fortune Society, spotlights Rikers Island. The prison, located between Queens and the Bronx near LaGuardia Airport, has become a powerful symbol of the dysfunction of the criminal justice system. The night before the summit, Martin and Venida Browder came together to tell the story of Browder’s son, Kalief Browder, whose arrest at 16 for the alleged crime of stealing a backpack and subsequent three-year imprisonment at Rikers Island without trial sparked a national debate about solitary confinement and calls to shut down the jail. It is just that sort of discussion that organizers of States of Incarceration hope to ignite. For participants in the project, which includes individuals working collaboratively across disciplines, the goal is to fundamentally transform the way we, as a society, think about incarceration and to advance policy changes to address the problem.